Crafted in the late 19th century, the pair of short operas are textbook examples of the verismo style. Leoncavallo wrote Pagliacci in response to Mascagni’s Cavalleria Rusticana, hence creating an ongoing conceptual link between the works. 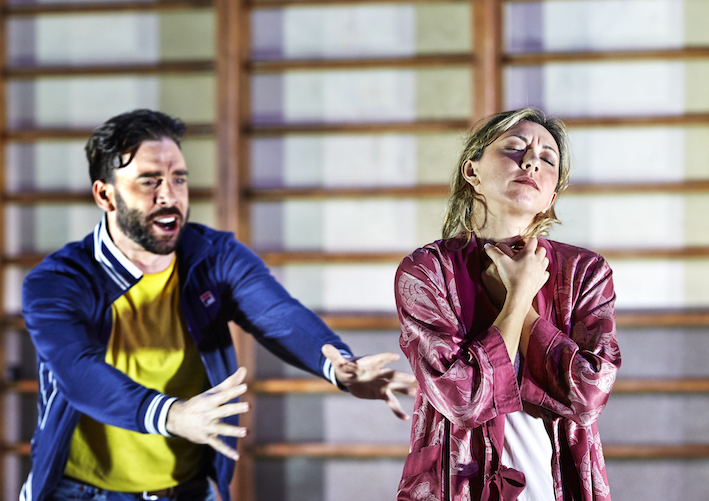 In this ingenious new production, created at Royal Opera in 2015, director Damiano Michieletto has taken the link even further, setting the two operas in the same small Italian village and deftly interweaving the characters and plot. This clever concept, just one of the director’s innovations for this production, reaps rewarding viewing for the close observer. Both operas feature an intermezzo, and Michieletto makes his prime connection between the operas in these moments. During Cavalleria Rusticana, the affair between Pagliacci’s Nedda and Silvio is seen to be already in full swing. During Pagliacci, a moving coda to the tragedy of Cavalleria Rusticana is shown (no spoilers here). Further directorial choices enhance both works. Cavalleria Rusticana opens with a stunning tableau that brings to mind the 2016 mannequin challenge craze. 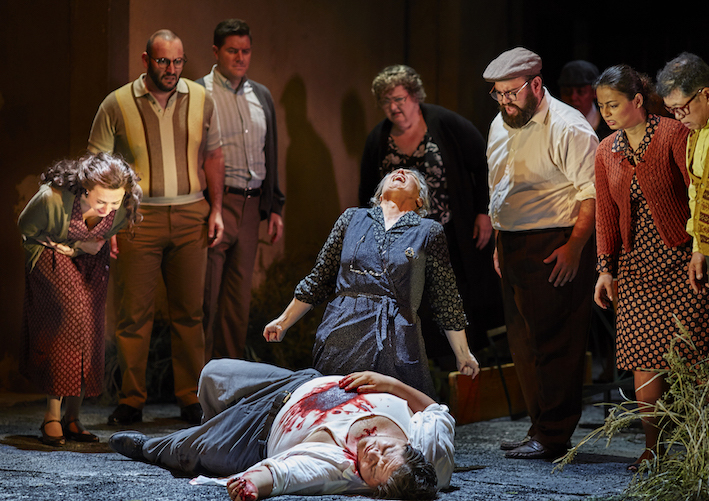 The bloody ending of the opera is shown, with a stand in playing the corpse and the singer providing the ghostly vocals off stage. In Pagliacci, an inspired sequence sees the play within a play dissolve to backstage, where crazed clown Canio has feverish visions of wife Nedda with fellow actor Beppe while the two are actually performing on stage. Again making use of doubles, the set revolves to show the simultaneous action creating a terrifically powerful sequence out of the relatively twee original sequence. Michieletto inserts one sight gag that is a wink to the combined concept and to the fact that the same singer plays both lead roles: as Turridu rounds the corner where Pagliacci posters are displayed, he does a brief double take at the sight of his own face (in the role of Canio). The interwoven concept is handsomely supported by Paolo Fantin’s pair of settings. Each opera has its own set, (Cavalleria Rusticana a bakery and town square, Pagliacci a modest hall and backstage area) and yet it is clearly the same town in the same era (the 1980s). Costumes, by Carla Teti, support the authentic sense of realism. Although Teti’s choice to eschew the traditional commedia dell’arte costumes in Pagliacci ties in with the natural style of the production, it takes away some of the colour and detail that would naturally be part of the performance being mounted by the travelling players. Maestro Andrea Licata leads Orchestra Victoria with precision and verve, really optimizing the quality of the beautiful instrumental passages. At times, the music threatens to overpower singing that is set in lower registers; the overall balance, however, is of a very pleasing standard. 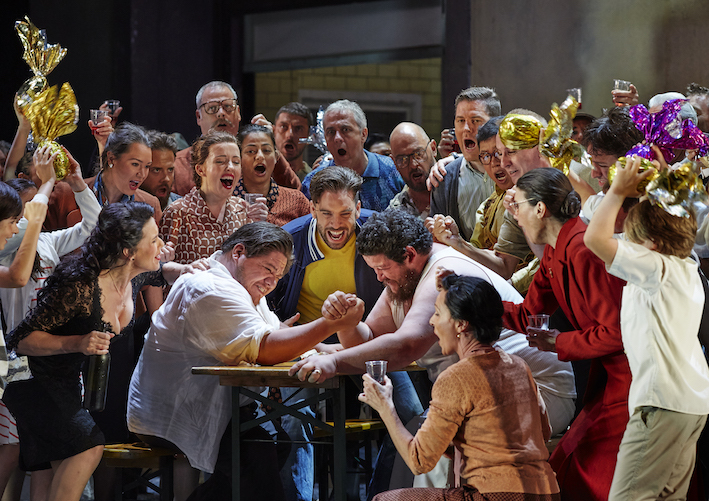 The scale of production is enhanced by a particularly large contingent of the Opera Australia Chorus, supplemented with an enthusiastic Children’s Chorus. Preparation for these groups is exceptional, resulting in a splendidly rich sound. 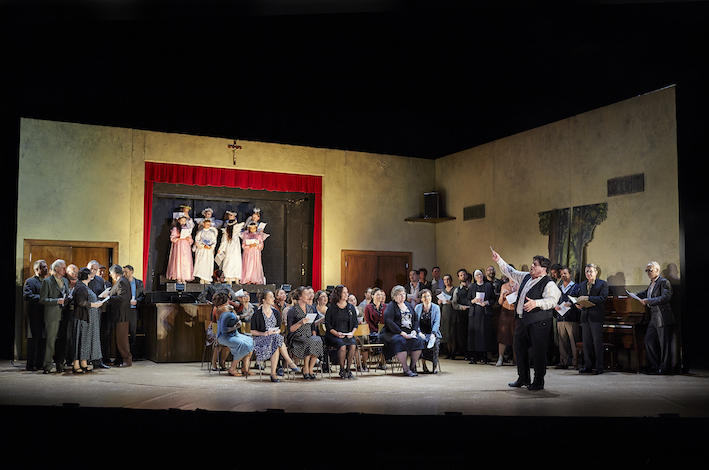 The Choruses are also to be commended for their excellent acting, the children are delightful in Pagliacci’s play within a play, the adults also contributing significantly to the climactic drama as the assembled crowd realise that something is seriously wrong with Canio. Taking on the massive task of singing both lead roles, mighty tenor Diego Torre is in excellent form. Unwavering in energy through the double bill, Torre’s voice rings out brightly with steely undertones of strength. Torre’s focused commitment to the drama heightens the impact; his performance as the insanely jealous Canio is particularly strong. In a nother benefit of the intelligent direction, Torre’s performance of showy well-known aria “Vesti la giubba” derived very naturally from the scene. Visiting Serbian soprano Dragana Radakovic creates a sympathetic characterization of Turridu’s wife Santuzza, showing her to be a vulnerable figure in a world of burly men. A singer in the Slavic tradition, Radakovic’s soprano sounded a little dark when paired with Torre in duet, particularly in her lower register. Playing the similar role in Pagliacci, Russian soprano Anna Princeva conveys a similar level of vulnerability as Nedda, showing the character as helpless to give in to forbidden passion. Princeva’s rendition of lovely aria “Stridono lassù” is somewhat undermined by direction that sees Nedda throw props about and pound the desk with her fist; nonetheless, her singing is a pleasure to hear. Also taking on dual roles, highly experienced baritone José Carbó is very well cast as a pair of self-serving cads. Carbó’s sensitive interpretation humanises these roles rather than simply presenting them as villains. 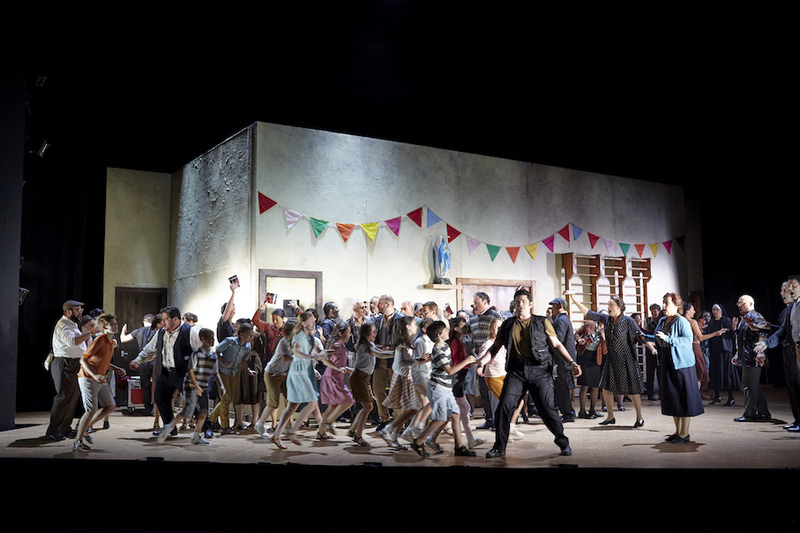 A highlight of Carbó’s performance is his sprightly work in the Pagliacci prologue. His singing in both roles is accurate and richly expressive. Dominica Matthews shines in the plum featured role of Mamma Lucia in Cavalleria Rusticana. 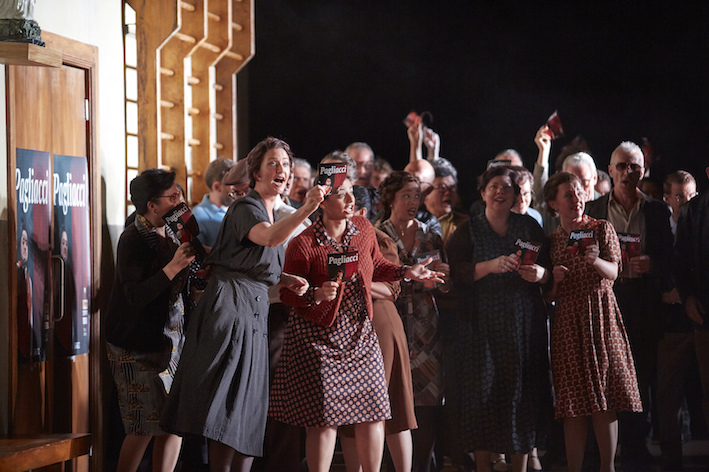 As Turridu’s devoted mother, Matthews sings with warmth and brings out both the joy and searing pain in the role. A gifted actress and excellent singer, young mezzo-soprano Sian Pendry gives another meticulously detailed performance as sultry temptress Lola. 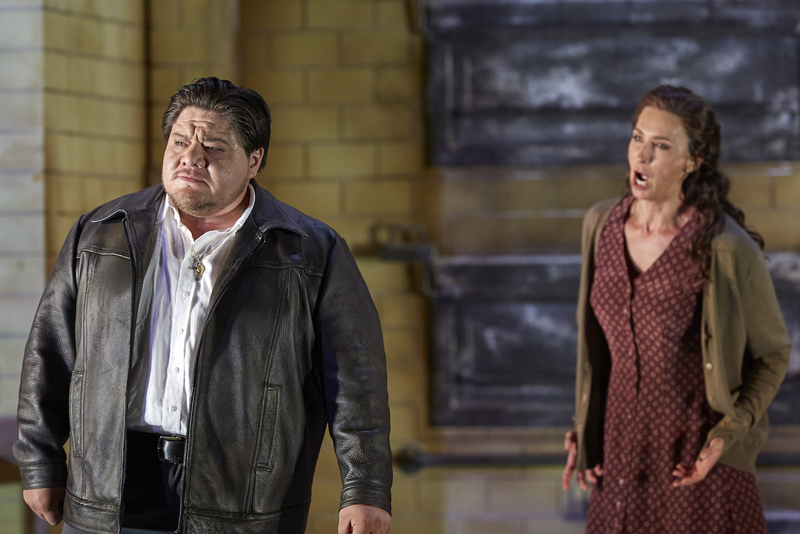 Young tenor John Longmuir is entertaining in the characterful role of Beppe. Young baritone Samuel Dundas brings out the ardent passion of Silvio; he and Princeva bring out the romance and tension of extended Pagliacci duet “Silvio! Nedda!” a real highlight. Long term operagoers who just might dismiss another round of Cav and Pag will find much to enjoy in this intelligently staged work. As an evening of grand operatic entertainment, Cavalleria Rusticana / Pagliacci is very hard to beat. 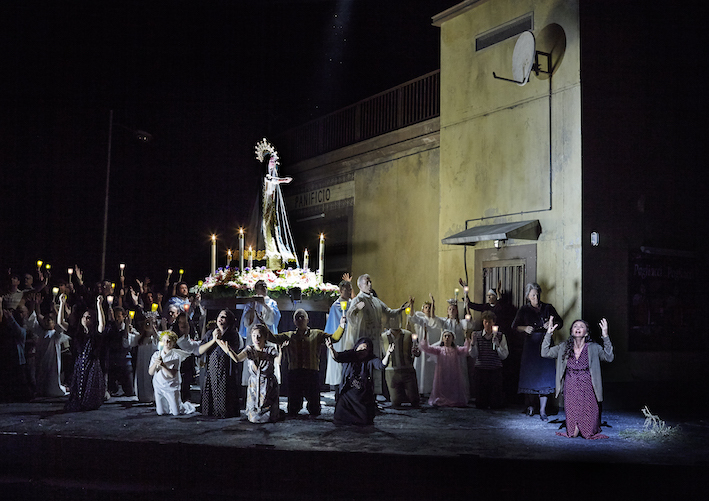 Cavalleria Rusticana / Pagliacci plays selected dates at State Theatre, Arts Centre Melbourne until 20 May 2017.